Three new Expedition 56 crew members were welcomed aboard the International Space Station today. Hatches between the space station and Soyuz opened at 11:17 a.m. EDT, marking the arrival of Expedition 56 Flight Engineers Serena Auñón-Chancellor of NASA, Alexander Gerst of ESA (European Space Agency), and cosmonaut Sergey Prokopyev of Roscosmos. The Soyuz MS-09 carrying the trio launched from the Baikonur Cosmodrome in Kazakhstan at 7:12 a.m. Wednesday, June 6. 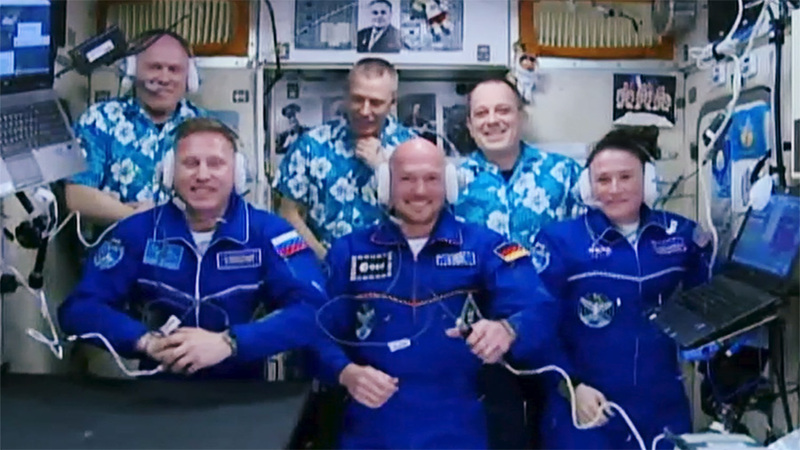 They joined Expedition 56 Commander Drew Feustel and Flight Engineers Ricky Arnold of NASA and Oleg Artemyev of Roscosmos aboard the orbiting laboratory. The crew members are also being greeted by family and friends who watched the docking and hatch opening from the Russian Mission Control Center outside Moscow. For more information about the mission visit: https://blogs.nasa.gov/spacestation/. Get breaking news, images and features from the station on Instagram at: @iss and on Twitter @Space_Station and @ISS_Research. I am 77 years old and I look forward every day to news from ISS. At night I’m in the back yard waving to the crew when it comes over my area. Have recruited “watchers” including my great grandson. Also, prayers always accompany my wave. Spotted the station tonight. Hello from Seabrook NH. An incredible sight to see the launch of the Soyuz and to see the preparation of the crew. And a truly International endeavor. Many thanks to NASA for making this available to us.